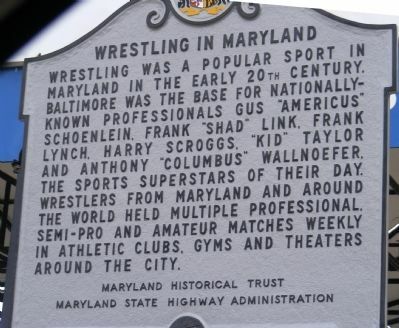 Wrestling was a popular sport in Maryland in the early 20th century. Baltimore was the base for nationally known professionals Gus “Americus” Schoenlein, Frank “Shad” Link, Frank Lynch, Harry Scroggs, “Kid” Taylor and Anthony “Columbus” Wallnoefer, the sports superstars of their day. Wrestlers from Maryland and around the world held multiple professional, semi-pro and amateur matches weekly in athletic clubs, gyms and theaters around the city. Erected by Maryland Historical Trust & Maryland State Highway Administration. Location. 39° 17.038′ N, 76° 37.182′ W. Marker is in Baltimore, Maryland. Marker is on West Camden Street. Touch for map. 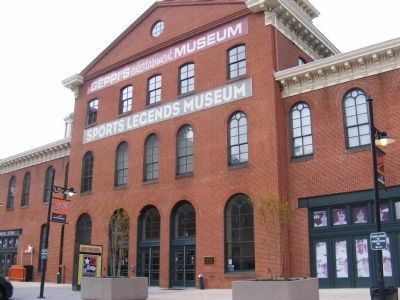 The marker is near the entrance of the Geppi's Entertainment Museum-Sports Legends Museum in the rear of the W Camden Street building. Marker is in this post office area: Baltimore MD 21201, United States of America. Touch for directions. line); Baltimore Regional Trail (about 300 feet away); Baltimore Riot Trail (about 300 feet away); Great Railroad Strike of 1877 (about 400 feet away); Babe’s Dream (about 500 feet away); Old Otterbein Church (about 700 feet away); Free State Pub (approx. 0.2 miles away). Touch for a list and map of all markers in Baltimore. More. Search the internet for Wrestling in Maryland. Credits. This page was last revised on June 16, 2016. This page originally submitted on November 9, 2012, by Don Morfe of Baltimore, Maryland. This page has been viewed 434 times since then and 5 times this year. Photos: 1, 2. submitted on November 9, 2012, by Don Morfe of Baltimore, Maryland. • Bill Pfingsten was the editor who published this page.